Our first Basey ancestors to arrive in America were Charles1 and Mary Amy Basey1, who arrived from Prussia. The family history prior to this arrival is unknown except through a story passed down through the family. Allegedly, there were seven brothers who moved to America on the same boat and one died on the way over. The remaining six did not settle together, but moved to different areas of the country. When our ancestor arrived in Indiana, the name was spelled Basey rather than the original Boese. In addition to the children listed above, they are alleged to have had three additional daughters, whose names are unknown. As our ancestor, Charles Williams3, was not living in the household, he is recorded in a separate entry. James H. Copeland was listed as living with them as a farm laborer. Charles William Basey 3and Anna Elizabeth Faudt4 were buried in the New Palestine cemetery, off Gem Road. Ida Mae Basey5, born 4 Nov 1864 never married, but had one son. She was buried in London Cemetery. Her pictures may be viewed here, here and here. Charles Archie Basey6 (1 Apr 1894-7 Dec 1973, ss:316-38-6029) married Bertha May Means7(4 Apr 1897-6 Dec 1973) Archie and Bertha had four children. Their picture can be viewed here. Carl Wilbur Basey 8 (2 Nov 1919-16 Feb 1996) married Margaret Irene Hendrix 9 (6 May 1924-), daughter of Carrie Carter and John Philo Hendrix. They had three children. Divorced David Hockett in 1983 and married Greg Dunn in 1990. The children's names were changed. CHARLES ARCHIE BASEY6, born April 1, 1894, was the son of IDA MAE BASEY. His mother never named his father either privately or publicly and contemporary family rumor was that she was raped. 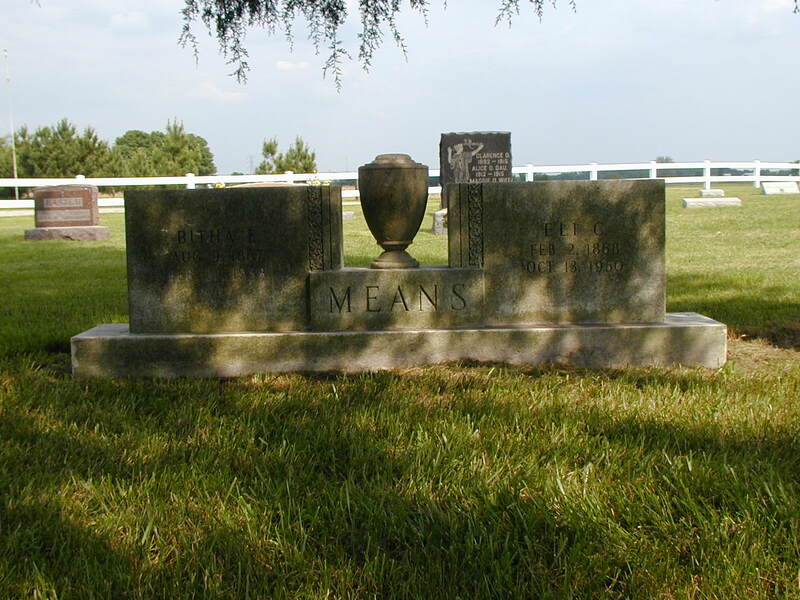 The family lived in Moral Township of Shelby County, where he attended school and married Bertha Mae Means, the daughter of ELI and TABITHA MEANS, who was born April 4, 1894. As a young man, he worked for John Madden Furniture Co., in Indianapolis. After marriage, he became a farmer and lived for a while in the McCordsville area of Hancock County. Later, they moved to one of the Andis's farms, where they lived for 29 years. They later bought a farm of 90 acres from Perkins. They lived and farmed this land until his death December 7, 1973. He was never called CHARLES as an adult. Everyone called him, ARCHIE. A picture of Archie as a young boy can be viewed here. BERTHA MEANS BASEY7 died after a long illness. She was stricken with arthritis as a young adult and had great difficulty walking in her later years. Her final days were spent in a nursing home and when she died on December 6, 1973, ARCHIE took his own life the next day. A picture of Bertha during her younger days is here. REMEMBRANCES: Although ARCHIE completed the 8th grade, he did not graduate because graduates were required to give a public speech. He was very shy and refused to give a speech, preferring to forfeit his degree. As an adult, he had a reputation for honesty, stubbornness, and an impossibly high standard. When ARCHIE and his son, CARL, put up fences, he complained that one fence post was off after eyeballing it. Upon checking, CARL discovered it was 1/16th of an inch off from the other posts. The electric utilities were placing electrical towers through eminent domain and approached him with, "Good news, Mr. Basey. We've chosen your land for two towers and we're paying you $100 apiece to place them on your property." ARCHIE offered them $200 to put them somewhere else. As the neighbor across the street wanted a tower on his land, one of the towers was erected there. However, ARCHIE was still required to accept the first tower and often complained about the nuisances associated with plowing around it. ARCHIE smoked, but was not a social drinker. He was strictly a meat and potatoes eater and was very fussy about his food. This is reputed to be the source of the finky eater gene in the family. He was tall and his dark hair turned snow white. He had incredibly beautiful, bright blue eyes. REMEMBRANCES FROM HIS YOUNGEST DAUGHTER, LINDA: Father was born blonde, but his hair darkened over the years and he inherited his mother's hazel eyes. Those eyes were green with flecks of gold, with a little blue mixed among them; yet when he was angry, those eyes were jade green. I considered his eye color to be an early warning system, which I usually noticed too late. Father always combed his hair the same way and always carried a comb in his pocket. He didn't allow anyone to mess with his hair. Father grew up on a rented farm and my grandparents bought a farm when he was nearly grown. The story Father used to tell is that Grandpa expected him to earn his own way by hiring himself out as he had. However, Father couldn't stand working on the farm because the dust stirred up his asthma. Thus, Father went to the Indiana Business College and pursued a white collar degree. Father had played basketball in high school and continued doing so in business school. He worked in a restaurant to pay his way through school. After 18 months or two years, he graduated and went to work for Texaco before being drafted. It was about this time that he met and married my mother, Irene Basey. I wasn't around for those early years, but I heard my sisters talk about Father making them pump water so he could wash the car. Mother tells me that while he was in the service and stationed at Fort Logan, Boston, MA, he slipped and fell on the road and broke his ankle. While in the hospital, he had an asthma attack and the military decided to put him on medical. He was discharged. Father had known someone at Delco Remy and wrote to him before he was discharged in November. He worked in the office for a while and then moved to the assembly line. The boss told Father that he had the cleanest work place in the plant. Given how Grandpa was about Father scrubbing out the stalls after the cows had left, etc., I guess keeping a clean desk was easy. Later, he heard that there were better paying jobs at the Chevrolet plant in Indianapolis, so he changed jobs. Later, he went to a small plant in Anderson that was doing war work. However, it shut down and the next place he worked was Meier Electric, which later became Lau Blower. He retired there after 35 years. I remember Father as the pickiest perfectionist I have ever known. Everything had a place and it darn well better be there, facing the right direction. He knew if you borrowed his hammer and he knew if it faced east rather than west when you returned it. Grass had to be cut a certain height and a certain way and woe upon the daughter who did it wrong. I note that none of us three daughters adopted his perfectionist ways and I think we all had an overdoes of orderliness growing up. However, I always through Father was capable of doing anything and if he didn't do it, it was because he didn't want it done. He was six foot two and looked taller. He was strong. I watched him pick up things while wearing a back brace that a younger and taller man couldn't have done. He bought a chain saw and civilized the woods next to our house and built a garage after buying a small cement mixer. He couldn't find a phone stand that suited his needs, so he built one himself. People used to stand in line to buy his cars when he traded them in because they were in immaculant shape. No one ever smoked, ate, or drank anything in one of his cars and he washed them every weekend. Father had energy-induced asthma all his life, which is one reason he was drafted very late into WWII. He was made a clerk and thus it's all the more amazing that he came home at the same time every night, changed clothes, ate dinner exactly at 6pm, and went outside or into the garage to work on some project every weekday. On weekends, he worked harder than some people work during the week. I had a cultural shock when I married someone who hadn't any idea how to fix anything. I'd never needed to call a repairman when I was growing up. Father always fixed everything himself... or so it seemed. Being a perfectionist, Father had high expectations of us that I don't think any of us ever met. I remember he was very disappointed in me when I divorced and then annoyed that I'd stayed married so long once he discovered the reasons behind the divorce. [I believe he said something to the effect that he hadn't raised me to be a damn fool.] He had always said never to ask to borrow money, because he would never lend it, and yet he called me during the divorce proceedings and told me to stop by to pick up a check. I was shocked. Father explained that I hadn't asked for it and I damn well better pay him back, which I did when I sold the house. Father's bark wasn't worse than his bite. You didn't want to be around him when he was angry and you didn't want to be the one he was angry at. I don't think I ever forgave him for killing my dog, which had developed into a fence climber who defeated Father's every attempt to keep him within the pen. He had his standards and he had little tolerance for anyone or anything which couldn't meet those standards. Father was also a practical joker. I think the most memorable one was when he took a picture of mother in the bathtub and later passed around a picture that he claimed was the one he'd taken. [It wasn't, but it certainly got Mother's notice.] I remember him slipping ping pong balls in with the unboiled Easter Eggs and picking them up to juggle in front of Mother. I remember the pop strings that made a loud bang and smoked that he'd attached to doors to scare the heck out of one of us. I remember the one he wired into my first husband's car so it exploded and smoke rolled out from under the hood when he started the car [without doing any actual damage to the car]. Father loved jokes like that and while it sometimes drove some of us nuts, I notice that a few of us inherited his sense of humor. Poor Mother had to put up with all of us. Father's use of over-the-counter inhalers for his asthma probably led to his heart attack. In very fine print, most of them warn that long term usage can lead to permanent heart damage. To the best of our knowledge, no one in Father's family had ever before died of a heart aliment. Mother had to practically drag him to the hospital and he insisted upon finished washing his truck first. He thought the pains were just asthma or pneumonia, but an EKG showed he'd had a SECOND heart attack and we have no idea when he had the first one. It was too late for surgery and a few months later, he went into the hospital for an emergency gall bladder surgery. Although he survived the surgery and initially improved, he took a sharp turn for the worse on the 15th and died the next day. Father was buried in one of his suits, with a hankerchef in his pocket and holding his best Stetson.